Book a Pigeon Forge Cabin for your next vacation to the Smokies! Planning a vacation in Pigeon Forge? Heartland Cabin Rentals offers some of the best Pigeon Forge cabins. Browse our list of our Pigeon Forge Cabin Rentals. We offer several cabins in and around the area of Pigeon Forge, Tennessee. 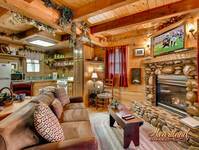 All of our cabins, vacation homes, and chalets have full Kitchens and hot tubs. Make Heartland Cabin Rentals your home away from home. Book your cabin today and save online! 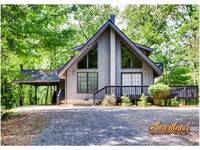 2 Bedroom 2 Bath Cabin between Pigeon Forge and Gatlinburg. This dreamy log cabin reflects the beauty and warmth of the Smoky Mountains in its decor and features a nice mountain view. A large king master suite offers a Jacuzzi tub, TV, Full Bath, Fireplace and a large... THIS CABIN IS NOT PET OR SMOKE FRIENDLY! Beaver Fever is a lovely, luxury log cabin nestled in Gnatty Branch Village, a serene wooded setting just off the Spur mid-way between Pigeon Forge and Gatlinburg. Guest will enjoy top-notch amenities of large TVs, custom stone stacked fireplaces, jacuzzi tub, hot tub, pool table and much more! "Feels So Right" is a 2-level, 2 bedroom cabin nestled in the woods. Be immersed in nature and only a short drive to all the fun, excitement, and entertainment of Pigeon Forge and Gatlinburg. Have all of your favorite amenities at your finger tips including WiFi, Pool table, and private Hot Tub. Book this cabin today! THIS CABIN IS NOT PET OR SMOKE FRIENDLY! Call of the Wild is a true 2 Bedroom log cabin beautifully landscaped and furnished in mountain/native American decor. It sits on a private wooded lot at the mountain top with seasonal mountain views. The dead end road is great for evening walks, sitting on the front porch in one of the rockers.... THIS CABIN IS NOT PET OR SMOKE FRIENDLY!